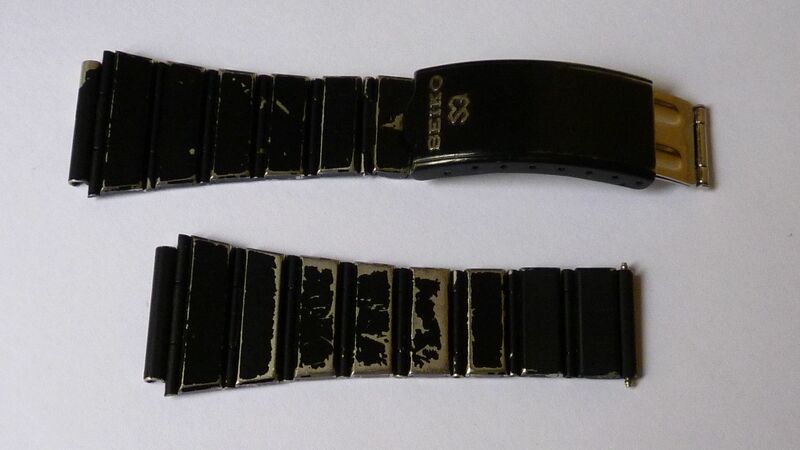 What type / quality of metal is under the plating on the Seiko 7A series watches ? That's a good question. The stainless case is remarkably free of ferrous metal, (totally unmoved by my almost violent degausser) but until the rough SGP watch arrives I'll not be sure if there is any iron content. The spots on one of mine does seem to be common or garden rust, which when you think about it seems crazy when one needs to keep magnetism to a minimum. Perhaps it's some kind of coating under the gold. I've just paid over the odds for a modest sgp 7A38-7000 - because I thought I needed some parts. Paul suggested my notions about replating might be applied to this particular 7A38-7000. (About ten minutes later I made the faulty watch go, so wish I hadn't paid so much.) Tonight there's another one on the bay with the plating worn on the top edges and separating underneath. Anyway, I'll try to answer your question sometime this week at least to check if there is any ferrous content. 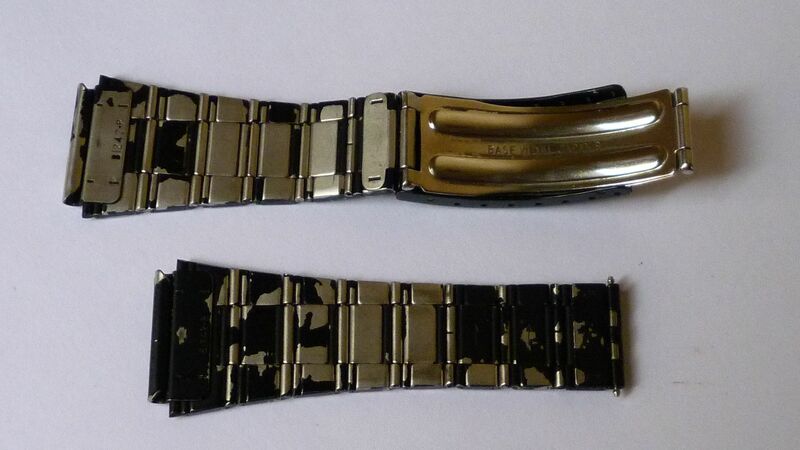 I'm astonished Seiko put so much work into these fine watches and then have an SGP finish on such a vulnerable metal. Paul recalled an experience with a SGP case that was showing signs of the gold degrading from within over most of its surface. My first purchase of a 7A38-7000 for nearly 30 years was with the knowledge it had some issues where it had been in contact with the wearer and two small spots on one edge. I plucked up courage and rubbed hard at the back area with my fingernail. A small flake came off but then it seemed stable no matter how hard I rubbed. (phew!) However, there was peppering up and into the back thread. With the band on, the general appearance is of a very attractive watch, but as is, will never be a collector's item. When it arrives, I'll subject the latest case to the degausser. If it does indeed turn out to have any ferrous content, I'll post on that. Thanks Rob--I had read somewhere that plated 7A's were low grade stainless. I have looked at many photo's of plated cases and have not seen the tell tale heavy pitting that happens with true "base metal" cases. http://www.network54.com/Forum/78440/thread/1266788329/Question+Base+metal .... But it's not the thread I was looking for. Oh, and by the way, remember the old adage: All that glisters (glitters) is not gold - not in Seiko's rule book anyway. 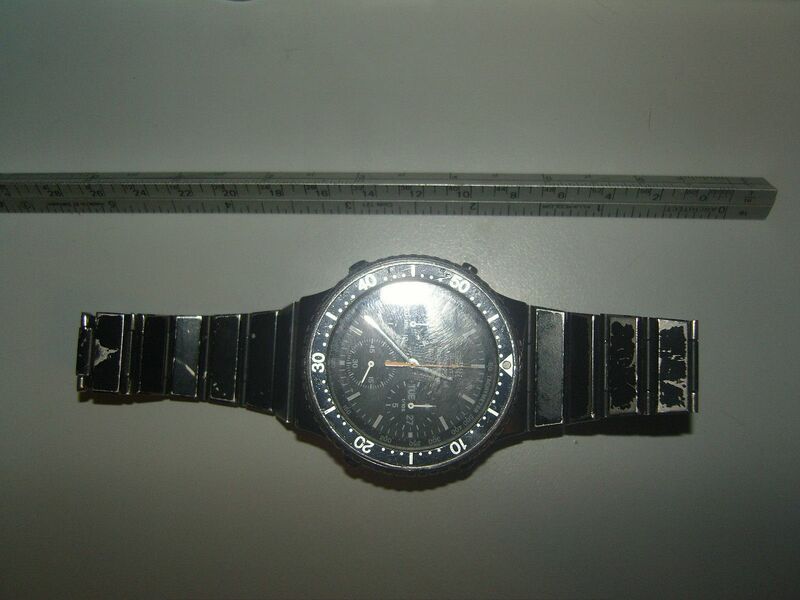 See: http://forums.watchuseek.com/f21/gold-plating-question-570010-post4177192.html (worth also noting Pawl_Buster's post # 8). But things like SGP on a Seiko or CGP on a citizen generally don't mean real gold; rather Gold like or Gold colour plating. This info can be found on charts outlining what the various letters mean on the case backs of these makers products. (as posted above). 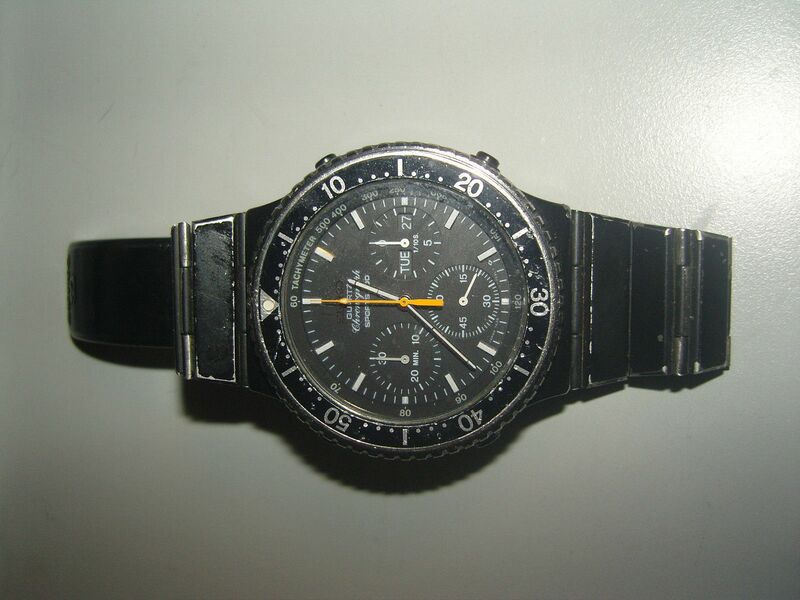 I've received this from Seiko Australia, which was a longshot. They openly say they don't have records for that age. "By the look of your contact information you are not located in Australia whom you have contacted. We do not have information on the series you are enquiring about – they are either too old or have not been sold in Australia. The symptoms you are speaking of sound as though they are base metal, usually brass, with gold plating. After a while the gold plating wears away and the brass can pit. Ah well. Back to the magnetic tests. A low grade stainless makes the most sense - a true nickel chrome product is something from a different era. An interesting thread. I doubt very much if any of us will ever get any straight answers from Seiko. They have obviously much improved the coatings they use nowadays, and apart from the (we don't) 'need to know' basis, we're talking about product they manufactured 30 years ago and more. Something that has always intrigued me is the coatings they used on some of the 'Sports 100' 7A38's (and other 7Axx's). 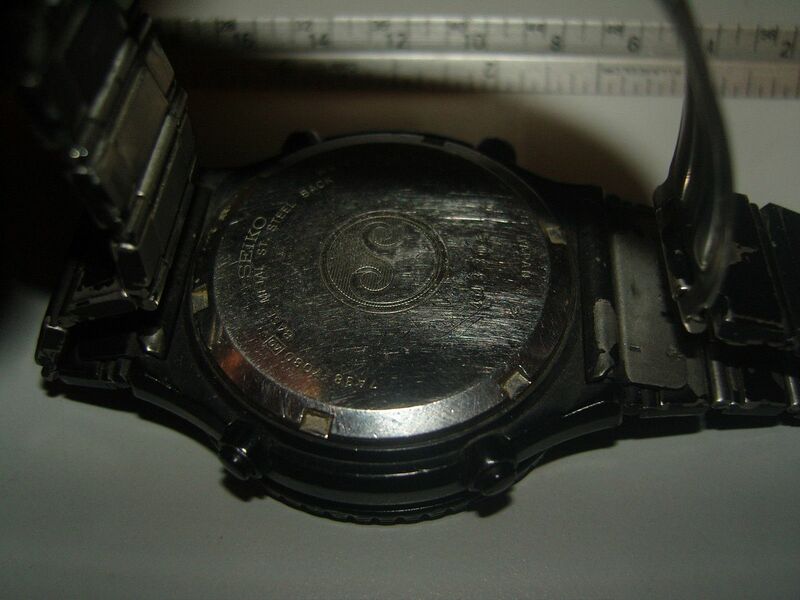 All of these watches have case-backs stamped either 'Base Metal' or 'BCRP' and if you call them up on Seiko Oceania's database they all show 'BCRP' in the case material field, without exception. Indeed, if you look at any well worn example of a dark grey 7A38-704x or a chocolate brown 7A38-6020 (I have examples of both, particularly the latter) you can clearly see the black chrome plating underneath. My question is: What is the matt outer coating over the black chrome plating, that is so soft and VERY susceptible to rubbing wear ? My belief is that it is nothing more than sprayed paint ! I did actually seriously consider re-spaying that first 'beater' 7A38-6020 I bought. I even went as far as to mix up some matching paint. I wrote about my idea in this thread on RLT, dating back to November 2011 - to the obvious bemusement of some posters. I was deadly serious at the time, but the following year I bought a much better almost pristine example, so I never got round to it. I've since thought about re-spraying my 'beater' 7A38-704C too, particularly since I bought another almost mint example last year. 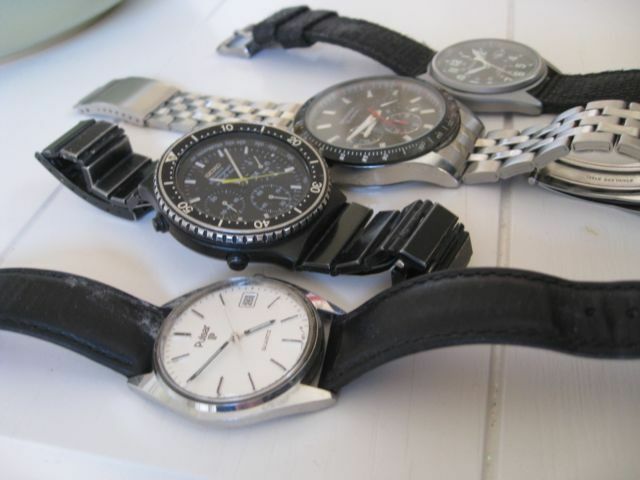 Nowadays, I generally tend to avoid any of these watches where the black chrome and / or the outer coating is badly worn. However I will occasionally make exceptions. Last week, I bought a 'spares or repairs' 7A38-7080 in a job lot, with worn coating. 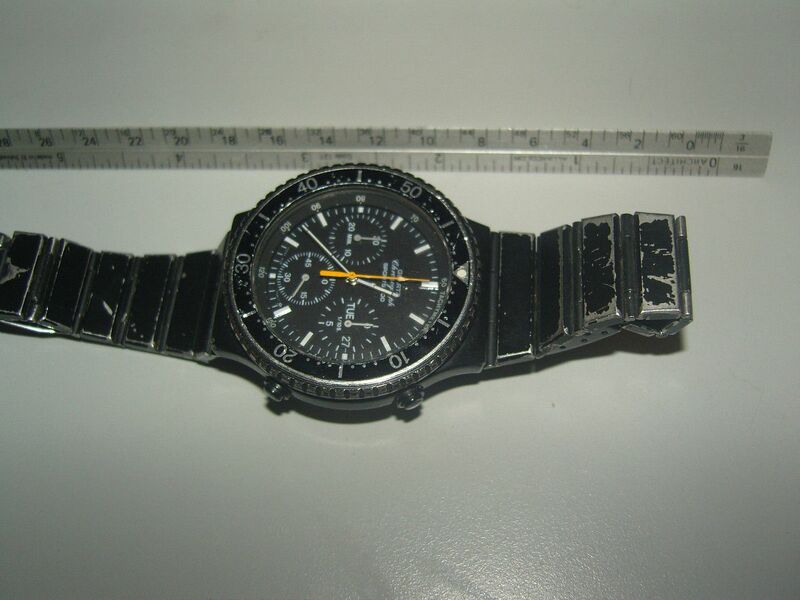 In this instance, I didn't care less about the worn outside condition of the watch. All I wanted it for was as a donor for its dial / movement and Tachymeter ring, which are now earmarked for another Franken project build. As it turned out, the movement needed rather more than 'possibly just a new battery', and took some titivation / persuasion to get it running again. But that's another story. Regardless of whether I needed them or not, the case and bracelet got the usual overnight soak in neat Flash, followed by a gentle scrubbing with an old toothbrush under the tap and a quick spin in the ultrasonic cleaner treatment. The case came up quite well. In fact, as I was drying them off, I pondered whether it might we worth attempting to re-spray them, or leave 'as is'. 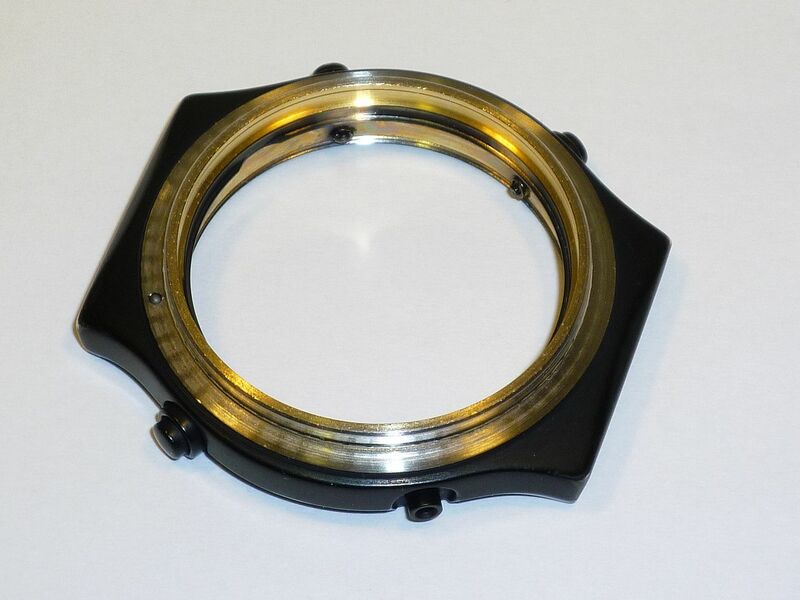 Anyway, to get back to my point, and on topic, what I noticed about the case was that not only was there clear evidence of over-spray on the inside and that although the bezel flange and track might have appeared 'stainless' the inside of the watch case was coated in gold-coloured passivate ! I already know all about (industial) powder coatings, thanks Don. The split rim wheels on my P4 Replica are powder coated in gold. It was a real pain of a job, because they had to be dismantled and masked - plus the outer rims had to be bead-blasted to provide a keyed surface. Apart from the fact that it's too crude a process to use on watch case and bracelet parts (let alone pusher buttons) there's the thickness of coating applied. The equivalent but more delicate (and far more expensive) process suitable for watches is DLC coating (Diamond like Carbon). I'm sure we've got a topic on it (or some mention of it) somewhere on the forum already. I know, because I looked into that already. In fact I never did get around to writing anything about DLC coating on this forum. I had seriously intended to at one point though. 'Part 2' was going to be my second Ferrari dialed 7A38 Franken. I had it all planned out exactly how it was going to look too. 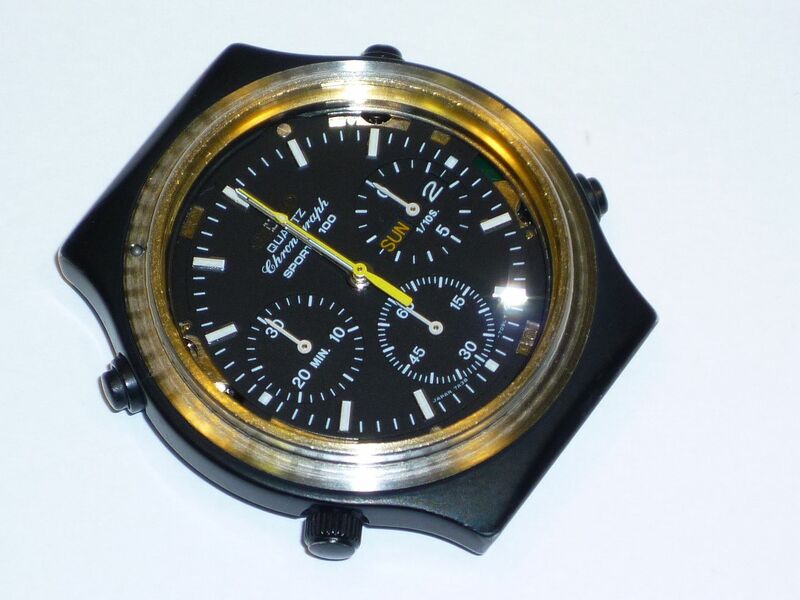 I was going to use a dark grey Ferrari dial I'd already bought on eBay, in conjuction with a black 7A28-702A Tachymeter ring. Then I had the idea of having the case DLC coated. I've found my notes and indeed I had contacted a UK company to get a quote. Apart from the cost, the other reason I shelved the project was that I was unhappy about the dial / Tachymeter colour mismatch. I've since sussed exactly which Ferrari dial I really need to use in this project, but until one happens along (unlikely) it's on hold. 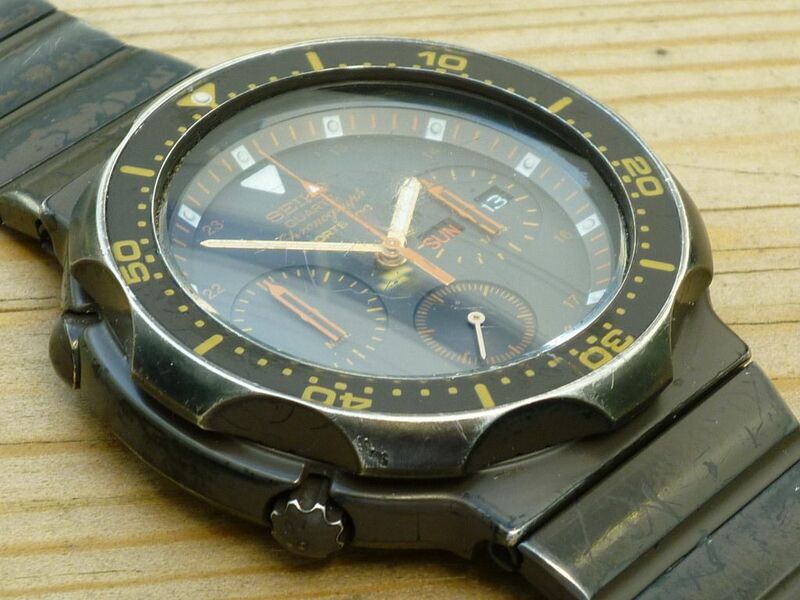 DLC was never used on any Seiko 7Axx in period. Probably the nearest coatings in terms of hardness was the Titanium Nitride / TiCN finish, used on a few models like the 7A38-725A and one of the 7A38-6080 variants (to name but two). Nope if you're going to re-furbish one of these BCRP coated 7Axx's I reckon you should at least try to be partly true to the original. Let's face it 'Black Chrome' was very much a 1980's fad - remember when cars switched from polished chrome to black bumpers ? To which end, I'd also contacted a plating company in Bristol who still do it. Went down to see them. But wasn't too impressed. Before I go any further, in an effort to try to explain my little discovery - and for the benefit of a few members who seem to get easily confused by the vaguaries of Seiko's part numbering, I'll give you a few simple examples. Or at least they're simple to me anyway. 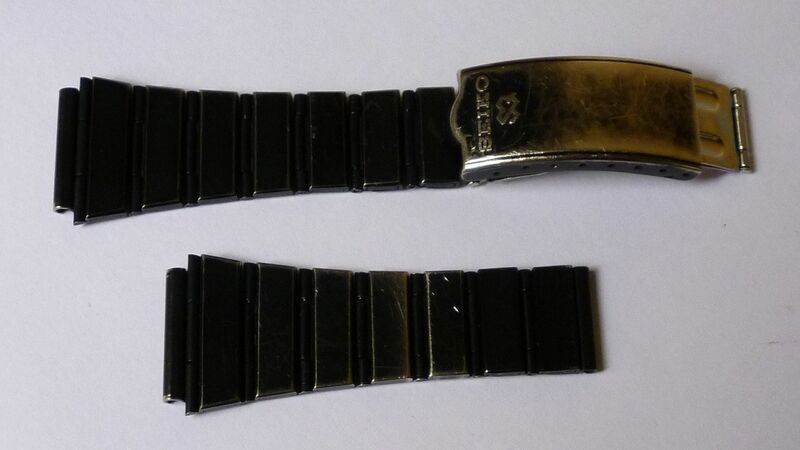 Take the folded link construction bracelets used on two of the commonest Seiko 7A38's: the 7A38-727x and 7A38-728x ranges. B1615.E and B1627.E, However, if you tried to order these part numbers (presuming they were still available) you'd be out of luck. Where 'S' = All Stainless; 'C' = Combined (Stainless / Gold two-tone) and 'G' = Gold (or rather SGP) plated. Make sense so far ? 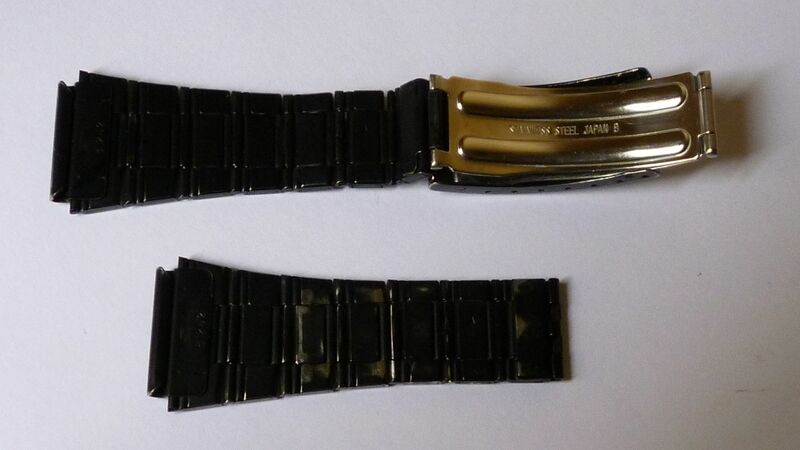 When the same base B1615.E bracelet was used on the black chrome coated 7A38-7290 / -7295, it became part number B1615F. Indeed the suffix 'F' is used on other black chrome (BCRP) coated bracelets - as is 'H' and also is 'D'. But on some coated bracelets (not meeting the 'S', 'C' or 'G' criteria), confusingly, you'll also find the p/n suffixes 'E' and 'S' used !! There are other odd anomolies besides. Take the silvery finished stainless 'hinged' bracelet used on the 7A38-7070 Diver. 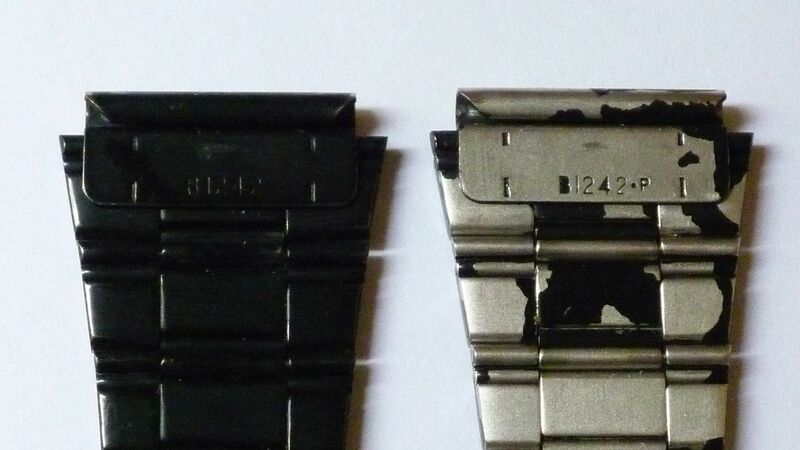 Often stamped B1241.E (though sometimes seen without .E) - it's actual part number as shown on Seiko's database is B1241S. 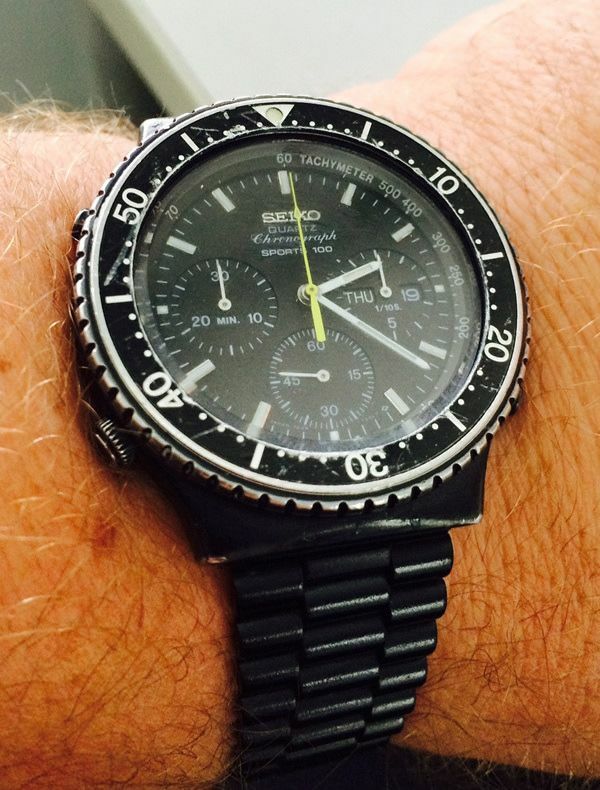 Seiko gave it the part number B1242S ! Which is where I made my little discovery. Recently, I'd bought another second 'beater' 7A38-7080 on eBay. It arrived yesterday. Overnight, I soaked the bracelet off the second one in neat Flash cleaning fluid. 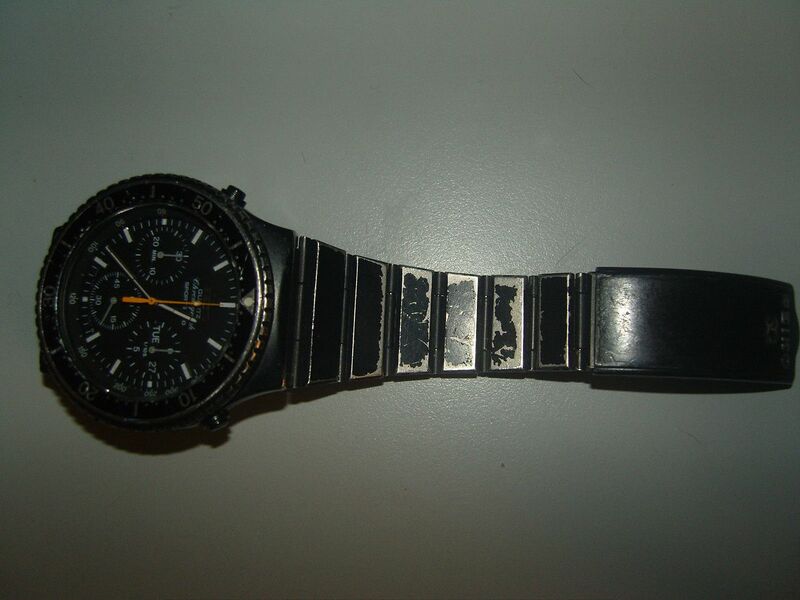 Before I did, it had already lost much more of its black coating, compared with the bracelet off the previous beater. But even more came off in the wash ! Here's some comparison photos. Oddly the SQ-logo'd clasp closer on the bracelet which had lost much of its black coating shows far less signs of rubbing wear. I reckon 'P' stands for painted. At the weekend I'll be digging my cans of paint stripper and cellulose thinners out of the garage. I think it's probably cellulose, rather than acrylic, George. But whatever it is, it's got lousy adhesion properties. While it was still wet (rinsed under a hot tap, after being soaked overnight in neat Flash), you could see the paint crinkling up at the edges. I picked a few more loose bits off the underside using the point of a wooden cocktail stick and scraped off most of what's missing from the springbar tube just using my thumbnail. By comparison, the better condition B1242 stamped bracelet is clearly matt black paint over black chrome plating (as it should be). 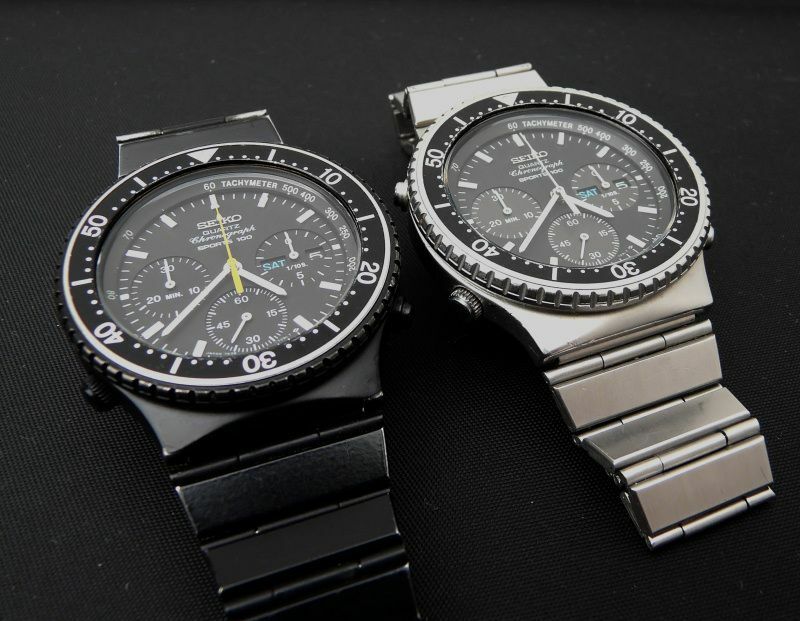 Both watch heads appear to be properly coated (the same way). They are both 1984 production - s/n's 44xxxx and 46xxxx. I'll be looking at some tougher paint. Maybe Humbrol enamel (lightly baked), or possibly Sperex VHT black exhaust coating. Very interested to see how the painting turns out. I'm glad you also found this thread, Greg - because this is one that I was going to re-direct you to, from your previous post in the 7Axx General discussion area. As you can see I'd bought a couple of 7A38-7080 'beaters'. My original plan had always been to 'rob' one of them for its 709L dial / movement to use in another 'Franken' project - then use the best components from the two to build up into one reasonably decent example. What I hadn't mentioned previously was that there was another factor driving this - bracelet issues. Athough it doesn't really show in the photos, the bracelet of the first one, with the faded yellow sweep hand - which still has much of the original black coating left is suffering, like yours, from 'stretch' caused by worn hinge pins. Typically, as Sod's Law would dictate, the other one, where the black paint falls off as soon as you look at it, is still reasonably tight. But as you can probably also work out from their overall lengths in my photos - both were annoyingly deficient of adjustment links. Turns out, I'll just have enough adjustment links from the two to make up one bracelet which will fit me. I plan to re-spray the 'peeling' one - plus all the adjustment links and the better clasp, using Humbrol plastic modeller's enamel paint. Luckily I still have a couple of 30-year old tinlets which thankfully haven't dried up. First in Gloss Black, then a top coat of Matt Black. I do have an 'antique' Badger 150-IL airbrush and a portable compressor which I could use - and have threatened to before. But I also have another slightly worn black chrome 7A38 restoration project on the go, which is rather more important to me. I'm fairly confident I could re-spray it myself and achieve a reasonable finish. But I'm never averse to seeking out someone who can probably do a better job, for me, than I can. Funnily enough, tonight, after work I'm planning to drop in on the monthly meeting of my local IPMS.